Bruce Willis does movies like Hostage to keep his game sharp, but he used to be sharper. The obvious parallel is to Die Hard, Willis’ entry into big-stakes cinema almost twenty years ago (can it really be?). There, he carried some of his brash Moonlighting persona into what could’ve been a standard-issue action hero, and he was surrounded by fine, vivid actors, not least Alan Rickman in a brilliant sneering-Eurotrash performance no one has quite matched since. Hostage is sorely lacking in divertissements and wit and all-around fun; it’s what you might call a tense, taut thriller, and it raises the ante by endangering children — which, for those of us who know the unwritten Hollywood rule that kids must be unscathed, doesn’t exactly keep us on the edge of our seats. Hostage is reasonably competent and breathlessly paced; the director, Florent Siri (who has filmed the “cut scenes” in various Tom Clancy video games), keeps things cracking. But the story, taken from a novel by Robert Crais, is by-the-numbers Hollywood crisis management. Willis is Jeff Talley, a former L.A. hostage negotiator who fails to rescue a child — which seems to violate the unwritten rule, but it’s really just a Past Trauma that explains why Jeff shaves his beard and skull and demotes himself to a desk cop in a smaller county. Wouldn’t you know, though, that Jeff gets pulled into another hostage situation? Three amoral teenagers, led by a sociopathic Ben Foster (from Six Feet Under), invade the house of a rich accountant (Kevin Pollak) in search of money. What they don’t know is that Pollak possesses a DVD containing data that shadowy men will kill to get — and these same men kidnap Jeff’s wife and daughter to force him to capture the disc and bring it to them. The disc is disguised as a DVD of the 1943 Gene Tierney movie Heaven Can Wait, leading to a mildly amusing movie-geek moment when a character has to choose between that and the 1978 Warren Beatty movie by the same name. 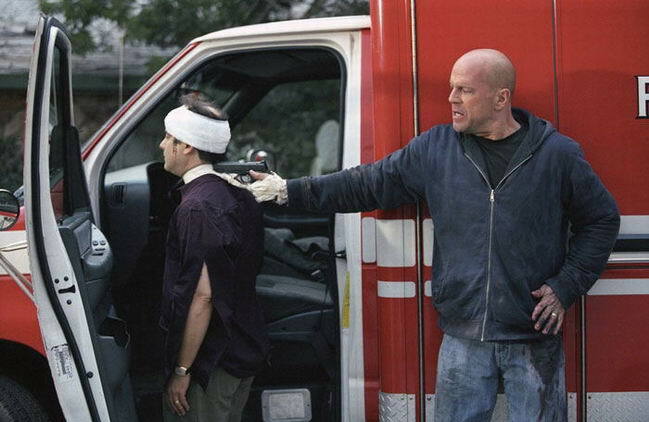 Be that as it may, Hostage is acceptable for what it is — a no-frills vehicle for Bruce Willis, playing a man who may be too sensitive to be a cop. (He cries several times, though a gelatin tear sticks to his eyelid at one point and doesn’t fall, and then in other shots it vanishes, and then it’s there again. It’s a goofy continuity error to let slip nowadays, when the filmmakers can easily wipe it in the computer.) Willis has gathered some gravitas over the years, to the point where his antics in something like The Whole Nine Yards seem like a surprising change of pace. But I miss the old Bruno, the guy who crawled through air vents in Die Hard (much like the little boy does in this film) and said “Now I know what a TV dinner feels like.” Remember that? Yeah, you do. Will you remember anything Willis says in Hostage seventeen years from now? No, you won’t.